This week we are chatting about all things Waterloo. As many of you may know, King Street is once again closed (north of Erb) for streetscape improvements. Although this may be affecting your daily commute, the city, community and business owners all appreciate your patience and support. This work will add beauty and functionality to this stretch of King Street and provide an amazing pedestrian friendly community for summer strolls, shopping and dining. Here are some upcoming events to get you out on the town, supporting local, meeting new people and enjoying our awesome city! May the Fourth: The Eco Well has been hosting Networking Nights at Settlement Co. and the next one is May 4th from 7 to 9pm. This growing event brings out an array of young, like-minded entrepreneurs with many specializing in sustainable and eco-conscious business. It’s a great opportunity to meet some amazing entrepreneurs in the area and chat over a coffee, beer or glass of wine. Friday May 5th: And of course, every tequila lover’s favourite holiday… Cinco de Mayo! This is a perfect day to head down to your favourite restaurant with some pals, pretend you’re in Mexico and enjoy a margarita or your beverage of choice. 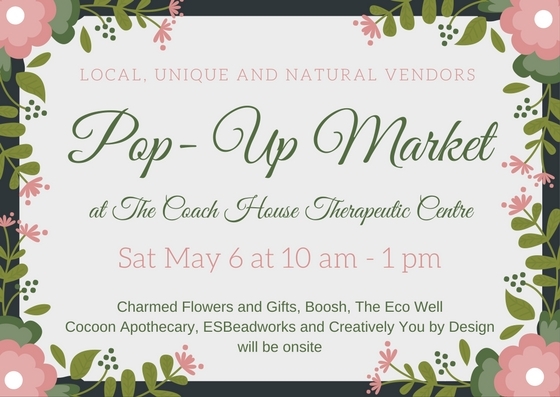 Saturday May 6: Next Saturday, The Coach House Therapeutic Centre is hosting a pop-up market full of local, natural vendors. Many of our favourite local businesses such as Boosh and Cocoon Apothecary will be there and it will be a great chance to pick up something special for Mother’s Day the following weekend. They have also partnered with Marbles Restaurant (across the street) for a fifteen dollar price fixe menu… yes, that’s correct, $15!!! Tuesday May 9th: If you like beer and want to try some of Wellington Brewery’s best, then this brewery sampling night is for you. Tickets are currently on sale to enjoy a night at White Rabbit, sample 6 of Wellington’s best brews and satisfy your tastebuds with a famous smoked brisket sandwich. Tickets are $30 which includes all samples and food as well as a souvenir beer glass and can be purchased here.